The Council of the Advertising Standards Authority (ASA) has ruled that Transport for London (TfL), trading as ‘Mayor of London’, made a misleading claim in an advertisement when it stated that the Ultra Low Emission Zone (ULEZ) ‘will encourage the use of newer cleaner vehicles to reduce vehicle pollution by half’. The ruling follows a four month formal investigation by the ASA into a complaint made by Clean Air in London (CAL). 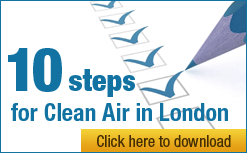 The ULEZ consultation opened on 27 October 2014 and closed on 9 January 2015. 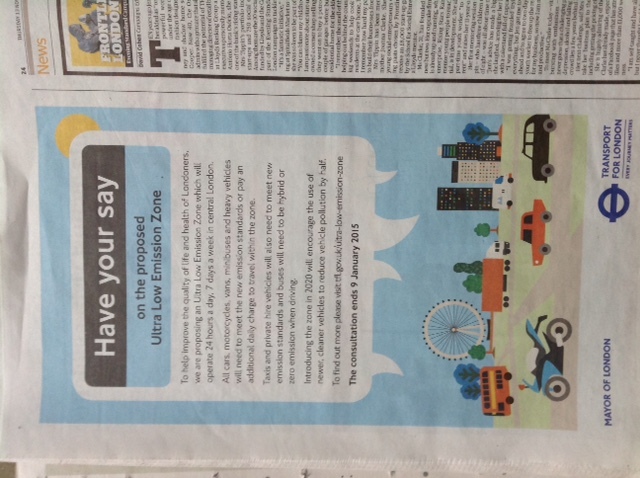 TfL and the Mayor of London made the claim in an advertisement titled ‘Have your say on the proposed Ultra Low Emission Zone’ which was published in the Evening Standard on 13 November 2014 (attached). The Mayor announced his decision to proceed with modified ULEZ proposals on 26 March 2015. The ULEZ will apply in the ‘Congestion Charging Zone’ (CCZ) only. Documents published during the consultation showed the projected impacts of the ULEZ on exhaust and total vehicle emissions in 2020 (and 2025). In other words, only projected NOx and NO2 vehicle emissions and PM10 vehicle exhaust emissions would be reduced by half and then only in the CCZ. CAL found no quantitative analysis of the impact of the changes to licensed taxi and private hire vehicle (PHV) regulations which are now omitted from the scheme. CAL complained to the ASA about the advertisement in a letter dated 24 November 2014 and submitted further evidence in a letter dated 8 February 2015. CAL sought a formal investigation by the ASA. A formal investigation meant the ASA Council would rule on the matter. The ASA contacted the parties involved (complainant and advertiser) and informed us of the process. They asked the advertiser to provide evidence for any claims they had made and may have sought justification about why the advertiser thought the ad was appropriate. The ASA considered all the information they received and placed the facts of the case before the ASA Council which decided that the Advertising Codes have been breached. Ads that break the rules are required to be amended or withdrawn. If they are not, the ASA will take steps to make sure their ruling is followed. The ASA investigated CAL’s complaint against the rules of the Committee of Advertising Practice’s (CAP’s) ‘UK Code of Non-broadcast Advertising, Sales Promotion and Direct Marketing (Edition 12)’ (the Code). “…we considered that the claim that vehicle pollution would be reduced by half was likely to be interpreted by consumers as relating to all types of vehicle pollution, unless it was made clear that it related only to certain types. We considered, for example, that consumers would expect carbon dioxide (CO2) to be included in the figure. “We noted that the reduction in pollution figures related to reductions within the zone only. We understood that CO2 was predicted by TfL to be reduced by 15% in the zone, and that reducing CO2 emissions from road transport was one of the stated objectives of the ULEZ. TfL provided figures showing the predicted reduction in PM10 and PM2.5 exhaust emissions as 64%. However, we understood that exhaust emissions were only a part of the overall PM10 and PM2.5 emissions, and that the figures given in TfL’s supplementary information for total road transport emissions in central London had been 14% for PM10 and 21% for PM2.5. “Because the claim related only to NO2 and NOx vehicle emissions, and excluded, for example, the figures for CO2, and total PM10 and PM2.5 emissions, we concluded that the claim was misleading. The ASA has ‘told TfL to ensure that they made clear in future that claims about reductions in vehicle pollution referred to specific types of pollution rather than vehicle pollution as a whole’. 1. the claim that taxis would need to meet new emission standards, because CAL understood that the standards would only apply to newly-licensed taxis. The ASA did not find the advertisement in breach in this respect. In the Mayor’s announcement on 26 March 2015 and a subsequent letter to CAL the reduced age limit of 10 years for licensed taxis from 2020 was omitted meaning that the ULEZ arrangements will now have no incremental impact on licensed taxis. New proposals for licensed taxis and private hire vehicles may be brought forward by this summer. In CAL’s opinion, it would certainly be misleading now for TfL or the Mayor to claim that ‘Taxis and private hire vehicles will also need to meet new emission standards…’ in relation to the ULEZ. 2. the claim ‘buses will need to be hybrid or zero emission when driving’, because CAL understood that around 10% of buses would be exempt. ‘[TfL] said approximately 300 New Routemasters, which were already hybrid and had emissions standards closer to Euro VI than other Euro V buses, would continue to operate in the ULEZ, without modification, at 2020. “Clean Air in London (CAL) welcomes the Advertising Standards Authority’s ruling with its wide ranging consequences for the way the Mayor and Transport for London (TfL) describe the air pollution benefits of their schemes in future. “In CAL’s view, the Mayor was as much at fault as TfL in this case. The Mayor of London was shown as the most prominent signatory for the advertisement. “It is deeply troubling that the Mayor and TfL made such a seriously misleading statement in a formal advertisement that encouraged responses to the public consultation on the Mayor’s flagship policy to tackle air pollution. The advertisement was wrong: on three regulated pollutants (CO2, PM10 and PM2.5); and for relying on exhaust not total emissions. “ULEZ consultation documents showed that vehicle exhaust emissions of nitrogen dioxide (NO2) and oxides of nitrogen (NOx) would be reduced by half in the central congestion charging zone (CCZ). However, carbon dioxide (CO2) and total particulate matter (PM10 and PM2.5) vehicle emissions would be reduced by just 15%, 9% and 21% in the CCZ respectively. NO2, PM10 and PM2.5 concentrations would be reduced by just 13%, 0.8% and 1.1% within central London and 4.4%, 0.2% and 0.2% London-wide respectively. Even these reductions assume action on taxis and private hire vehicles since omitted. This falls far short of the claim that introducing the zone in 2020 will encourage the use of newer, cleaner vehicles to reduce vehicle pollution by half. “Most of all, this investigation confirms again that the Mayor’s so-called ULEZ is too small, too weak and too late. Instead we need to ban diesel vehicles from the most polluted places by 2020, as we banned coal burning so successfully 60 years ago, with an intermediate step by early 2018.
the Greater London Authority (GLA) told the City of London in its response to the consultation on its draft Air Quality Strategy ‘The GLA will need to be consulted on the proposed location of this [PM5] monitor before installation plans are finalised’. For the avoidance of doubt, there is no suggestion that the Evening Standard did anything wrong when it published the advertisement. CAL original complaint dated 24 November 2014 and further evidence dated 8 February 2015 are attached. 3.3 Marketing communications must not mislead the consumer by omitting material information. They must not mislead by hiding material information or presenting it in an unclear, unintelligible, ambiguous or untimely manner. Material information is information that the consumer needs to make informed decisions in relation to a product. Whether the omission or presentation of material information is likely to mislead the consumer depends on the context, the medium and, if the medium of the marketing communication is constrained by time or space, the measures that the marketer takes to make that information available to the consumer by other means. The ULEZ consultation ran from 27 October 2014 to 9 January 2015. The Mayor announced his decision to proceed with a modified form of the ULEZ on 26 March 2015 i.e. allowing further exemptions and omitting changes to the age limit for licensed taxis. The ULEZ is due to enter into force on 7 September 2020 with a sunset period until 2023 for residents within the ULEZ and vehicles adapted for disabled people. Vehicles in the 40 year rolling vehicle tax exemption for classic vehicles will be exempt from the ULEZ standards. As part of the ULEZ consultation, TfL and the Mayor published a report titled ‘Supplementary Information’ dated October 2014 (attached) and other reports. A summary table appeared on page 85.
h. Table 12-C Impacts of the ULEZ on exhaust PM10 emissions by zone on page 80. In other words, only projected NOx and NO2 vehicle emissions and PM10 vehicle exhaust emissions would be reduced by half and then only in the CCZ.